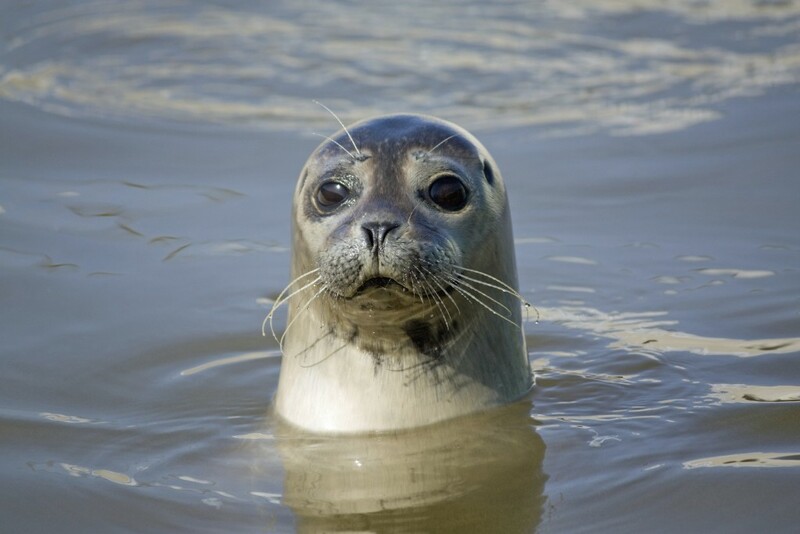 Seals in the Bay of Somme - Observation, time, guide, etc. If you’ve never seen these seals with their surprising expression and childlike eyes, pull on your boots and come to meet them – you won’t be disappointed! Just so you know, the Bay of Somme seal colony is the largest one in France. Meet at the Pointe du Hourdel, where everything starts. Walk through wide-open spaces and stands of white sand. First you’ll see one, then two, then, little by little, a multitude of funny little heads rise from the water. It’s a unique experience. We’re not at a zoo but really where they live. In their home. Their natural habitat. And we’re very welcome. Their big, wide-open eyes are soft and seem to be filled with indescribable kindness and humanity. We watch and we don’t move a muscle. It’s a wonderfully happy moment to share with your children. If it seems to you that some of the seals are twice as big as their neighbors, that’s quite normal. There are two types of seals in the Bay of Somme. But the guide will tell you more about them. At what time of the year can they be seen? All year long! At high tide and at low tide. At the end of spring, however, you can discover the touching spectacle of the young seals that have just been born. Where and how can the seals be observed? The Pointe du Hourdel is the place where the largest seal colony of the Bay of Somme is found. Le Hourdel is a small fishing village located 10 km from St. Valéry-sur-Somme. You can park right after the port at Le Hourdel, as well as along the quay. With a guide, you can get closer to the seals and learn more about these incredible marine mammals. He will also provide you with some very useful binoculars to observe them. If you wish, the guide Maxime Marzi will be delighted to accompany you: http://www.guide-baie-somme.com/. Please feel free to tell us what you think, ask questions or make comments! Or just ask for advice!